Are you looking for a headset compatible with Cisco 7940 IP phones? Great news! 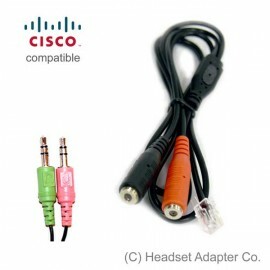 PC Headset Adapter transforms any computer headset with 3.5mm audio plugs into the Cisco 7940 phone's RJ9 modular plug. With PC Headset Adapter, you can now use a standard computer headset for your office phone needs. To connect a headset Adapter to the Cisco Unified IP Phone, plug it into the Headset port on the back of the phone. After connecting the modular plug, affix the adapter cable to the phone, inserting it into the cable management channel. Warning! Do not plug the headset adapter into the AUX port - it may damage your phone. Plug Microphone plug (Red / Pink) to RED headset adapter jack. To switch from handset to headset, press the headset button. Now you can place the handset in the cradle.